Arvolyn Hill is a GreenSchool Educator at NYBG. I love blueberries for their bold color, juicy texture, and delightful taste. When sprinkled on cereal or in pancakes, these common fruits add a healthy and sweet treat to most American diets. It was this flowering plant, part of the Ericaceae family, that eighth grade students from M.S. 244 in the Bronx set out to explore on the first of a three-day science institute held at the GreenSchool. As a new Educator learning about the variety of programs offered through Children’s Education, I got to tag along on their botanical adventure. M.S. 244 is a partner with Gaining Early Awareness and Readiness for Undergraduate Programs (GEAR UP), a national initiative to increase academic performance and success for middle through high school students administered by the Bronx Institute at Lehman College. The Bronx Institute in turn relies on NYBG, which for more than a decade has provided its students with multidisciplinary experiences in the natural world and the unique opportunity to learn first-hand from Garden professionals in horticulture, education, and plant science. Dr. Pedraza led us through a winding path of abundant plantings of mosses, bromeliads, and ferns whose arrangement in the built-in terraces of the cool, moist Upland Rain Forest mimics the mountainous cloud forests her real-life expeditions take her to. As she walked, she pointed out the varieties of blueberry plants researchers discovered and documented in the field and brought back to the Garden for conservation. 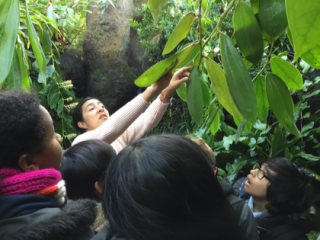 While searching through the tangle of green for the specific ones she referred to and trying to make sense of it all by reading the botanical plant markers, students were intrigued to hear about the extensive studies of the blueberry species native to the neotropical countries of Colombia and Ecuador. However, none of the plants Dr. Pedraza showed us seemed to possess characteristics anyone familiar with the botany of blueberries might recognize. Spindly plants growing in hanging baskets with sprawling stems and coral-colored blooms. Plants extruding from rocky, wet ridges with thick oval leaves, cylindrical white and pink waxy flowers, and nearly black fruits. These were not the highbush blueberry shrubs of my Connecticut youth. Still, for one teen, the patterns noticed in Cavendisha grandifolia, a plant native to tropical South America, reminded him of his home country. These discoveries and the natural conversations among our group from diverse cultures ranging from the United States, Latin America, and as far as Africa made the discipline of ethnobotany—the study of a region’s plants and their practical uses through traditional knowledge of local culture and people—come alive inside the plant museum. 200,000 acres of rain forests are lost each year due to deforestation. Despite deforestation, Dr. Pedraza and her colleagues made pioneering discoveries inside the national park. Fifty new plant species were found in Las Orquideas National Park. Seven new plant species are blueberry relatives. Blueberries are valued for their antioxidant properties, which are linked to a reduced risk of cardiovascular and pulmonary diseases. The Ericaceae plants Dr. Pedraza found in the neotropics have five times more antioxidants than highbush varieties grown in the United States. Scientists are working to discover new plant compounds in tropical blueberries that could hold cures for modern diseases. Antioxidant molecules are in the pigment or the “skin” of the fruit. The darker the berry, the higher the antioxidant content. Equipped with these facts, students were ready to conduct their own studies. 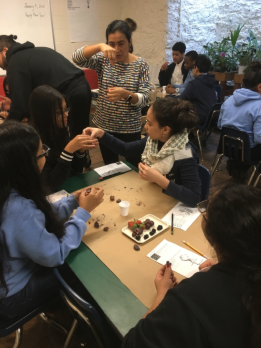 They dissected blueberries, strawberries, and blackberries and carefully observed and compared anatomies. Then, thinking like plant scientists, they discussed ideas they had about each and generated questions about what they might like to find out more about. Students reflected about the entire expedition while tasting dark, sweet blueberry juice (Who knew? Blueberry juice!) and fresh and dried fruits. Munching on blueberries and reconsidering this conventional breakfast staple, I pondered ways I might lead my next scheduled GreenSchool group on an equally revelatory botanical adventure!